Not far from the Dordogne River in France you can find the less known Vézère river. Just as in the Dordogne and Lot rivers night fishing is allowed and there are many beautiful carp spot along the banks of this public water. The major rivers in France are often hundreds of kilometers long and meandering through many cities and by many different departments. There is not much known about the size of captures on rivers in France. Therefore fishing rivers so interesting, because you never know what fish you will land and the many carp can swim hundreds of kilometers to show up at your spot suddenly. Earlier we described all the popular rivers Lot and Dordogne in the south of France. Less well known is La Vézère, a branch of the Dordogne that runs hundreds of kilometers in one of the least populated parts of France. Vézère is located in the Limousin region and its source in the Massif Central and then further flows through a beautiful area through beautiful villages like Bugeat, Brive and Montignac in the Dordogne region where Vezere ultimately ends up in Limeuil where 'hooked', in the Dordogne river. Much of La Vézère can be fished as a so-called public domaine. That means that this stretch of the river is owned by the French government that the water through network of local administrators make available (AAPPMA) for the general public what is allowed in the rule means that night fish (whether or not certain strips) . The piece of La Vézère in the Dordogne region, under the domaine public (cat. 2) is a total length of 78 kilometers and runs from the old bridge in Montignac until the end of La Vézère at Limeuil, where there is a merger takes place with the Dordogne river. Besides carp La Vézère is also a river known for migratory fish such as salmon, sea trout and eels swimming and also great sturgeon, catfish, pike and bass around. A beautiful Vézère carp (source: Fed Pêche Dept.). In terms carp file there is not much to say about La Vézère, simply because there is nowhere as indicated above summarizes catches. However, there are many online can be found on local carp enduro in the region, where we read about La Vézère carp between 15 and 20 kilos are regularly caught during multi-day fishing tournaments in the known larger towns along the river. Night fishing is allowed on large pieces of La Vézère, which can be found on the local site managers. Please note that there are strict rules, including catches of carp. So it is strictly forbidden to keep carp (and alive to transport) between half an hour after sunset and half an hour before sunrise. Nor should some larger pieces (lakes on the river (sometimes plans d'eau), where bathers stay) up to 1 kilo of bait used and there are heavy fines if fed more and / or the wrong bait used. The use of boats is not allowed everywhere, often near rapids and / or bridges or other obstacles. Pieces of La Vézère where carp fishing is allowed on both sides of the river are more places around Terrasson, Condat sur Vézère Montignac. Also a nice spot where La Vézère near the village Limeuil the Dordogne river flows. Again carp fishing allowed and who conducted some research discovered that there are several campgrounds are nearby. where bathers stay) can be used up to one kilo of bait and there are heavy fines if fed more and / or the wrong bait is used. The use of boats is not allowed everywhere, often near rapids and / or bridges or other obstacles. Pieces of La Vézère where carp fishing is allowed on both sides of the river are more places around Terrasson, Condat sur Vézère Montignac. Also a nice spot where La Vézère near the village Limeuil the Dordogne river flows. Again carp fishing allowed and who conducted some research discovered that there are several campgrounds are nearby. where bathers stay) can be used up to one kilo of bait and there are heavy fines if fed more and / or the wrong bait is used. The use of boats is not allowed everywhere, often near rapids and / or bridges or other obstacles. So you can book a place at Camping du Port de Limeuil located precisely at the part where the Vézère Dordogne flows (see photo on the website of the campsite above). This site also has an English website. Better is not! For more details you can of course go to the map on our website. If you are looking for big carp in a great natural area with lots of space, Lac des Settons might be something for you. The spacious 350-hectare Lac des Settons is centrally located in France, near the Lac de Pannecière . The lake of Settons has carp stocked with a record fish of more than 30 kg. 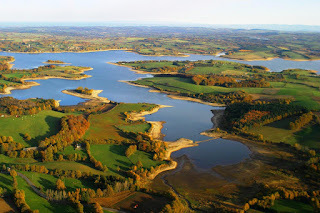 Lac de Pareloup is a huge public water of 1290 hectares, the fifth largest artificial lake in France. Night fishing is allowed on this magnificent public water, which contains may big carp with fish over 25 kg. Pareloup is located in the south of France, situated slightly above the two big cities of Montpellier and Toulouse in the beautiful Aveyron region. The 250 hectares Lac de Pannecière is one of the largest reservoirs in France. This public water , which is fed by the River Yonne, is known for its many huge carp with many specimens of over 20 kilos.